The Tate collection of modern and contemporary art represents all the major movements from Fauvism on. It includes important masterpieces by both Picasso and Matisse and one of the world's finest museum collections of Surrealism, including works by Dali, Ernst, Magritte and Miro. Its substantial holdings of American Abstract Expressionism include major works by Pollock and Rothko. There is an important group of sculpture and paintings by Giacometti and significant collections of Pop art, including major works by Lichtenstein and Warhol, Minimal art and Conceptual art. Tate also has particularly rich holdings of contemporary art since the 1980s. Sunday - Thursday, 10.00am - 6.00pm. Open as normal on bank holidays. Closed on 24th, 25th and 26th December but open on 1st January. Admission to the gallery is free, but donations from visitors are needed to support the gallery's work. There may be charges to visit exhibitions. 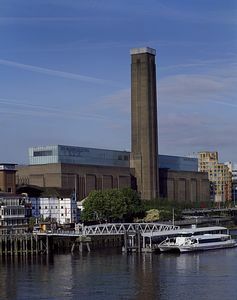 Tate Modern is located on the south bank of the River Thames at Bankside, near Blackfriars Bridge, opposite St Paul's Cathedral and next to the Globe Theatre. By boat: Tate boat runs every forty minutes along the Thames between Tate Britain, the London Eye and Tate Modern. By Underground:Southwark (Jubilee Line) and Blackfriars (District and Circle Lines) are the closest underground stations both of which are approximately ten minutes walk away.